Photographers always say that the best tripod is the one you take with you. No matter the vacation travel, whether you are hiking or flying, every ounce counts. Unfortunately, when choices need to be made because of weight, the tripod always seems to be the tool that is left behind. Choosing a tripod that is light enough for travel can be tricky. If it’s flimsy and wobbles in the wind it is useless. If it is sturdy and rugged then that usually means it will be heavy and force you to make packing compromises that could be difficult and unpopular with your family. Manufacturers do market tripod models to the traveling photographer, so there are many options available. The Gitzo 541 is often overlooked as a good travel tripod, because the company does not market it this way, but it is my travel tripod of choice. The Gitzo 541 is the lightest tripod that still gives me stability when I shoot with my Nikon D800 and my heaviest travel lens, the Nikkor 17-35 f./4 VR. The Gitzo weighs in at only 1.7 pounds, but it has an 11 pound load capacity. I use a Really Right Stuff BH30 ball head which adds 11.4 ounces to my luggage, but this combination allows me to use the Nikkor 70-200 f./2.8 VR with no problem. The Gitzo 531 retails for about $550. It is not cheap, but tripods and lenses are forever so you need to look at it as a onetime expenditure. Besides, a tripod allows you to get photographs you could not otherwise get. When you consider how much your vacation costs, the price of a good tripod is not that significant. Gitzo also has a nice selection of carbon fiber, light weight tripods in their Mountaineer, Traveler, and Explorer lines. For my purpose, I wanted the lightest tripod they make for my DSLR, and that’s the GT0541. At 1.7 pounds, this tripod is 13 ounces lighter and 2 inches shorter than the Gitzo 1541 Mountaineer (not to mention $200 cheaper) and it’s 8 ounces lighter than Gitzo’s Traveler tripod. The Traveler confused me a bit. It’s 2 inches shorter but the 541 with my ball head attached fits diagonally in my carry on. The traveler increases the load capacity from 11 to 15 pounds, but that’s not enough to support lenses heavier than the Nikon 70-200. So the extra 8 ounces for the Traveler tripod just doesn’t seem worth it when every ounce counts. I’d rather have the extra few ounces in my luggage for my Really Right Stuff ball head, which is so important for stability. When I was shopping for a light weight tripod, I knew that I would be making more tradeoffs and compromises than when I bought my current tripod. The Gitzo 541 is expensive and there is some shake to be mindful of even when you use your camera bag as a counterweight hanging on the bottom of the center column. But, on the other hand, this light weight offers a lot. The center column is removable, and the legs can go horizontal for macro work or low to the ground shots like a table top tripod. In addition, the Gitzo 541 can substitute as a monopod by extending the legs and not unfolding them for those locations where tripods are not permitted. And this lightweight tripod only weighs 8 ounces more than my monopod. 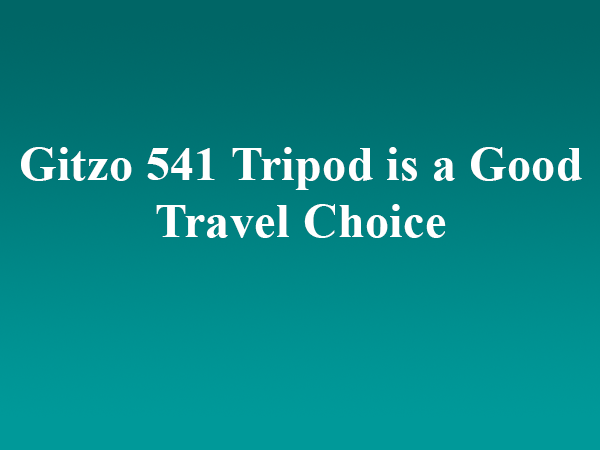 For all of these reasons, I highly recommend the Gitzo 541 as the travel tripod of choice.